Contact Author - Mrs D.
Mrs. D. (Olga D’Agostino), an award-winning author, grew up on a farm in a village nestled in the beautiful Carpathian Mountains in western Ukraine. Surrounded by nature and the real world, without TV and toys, she learned to read at a very early age, and books then became a huge part of her life. As a child, she used to create her own imaginary world populated with characters from books she read. She finished business college in Lviv, Ukraine.To escape the harsh reality of life in the Soviet Union, she immigrated to the United States in 1992 with her two small daughters. For many years she worked in her own business. In 2011 she started to pursue her childhood dreams, among them writing books for children. She is a member of SCBWI, speaks several languages fluently, and loves reading, writing and traveling. The City Kittens and the Old House Cat is a story written with a Christmas backdrop. Nyda, the cat, is happy in the family where she is living and she has settled into a comfortable routine. Her life changes when the eldest daughter of the family brings in two new kittens, Mickey and Jack. There is a lot of activity in the house and Nyda feels a little irritated with all the noise and happenings, and she resents their presence in the family. The story is a beautiful story of love and compassion. The way Nyda changes from a selfish and self-centered cat is truly amazing. It is a message for all of us that we need to change and a positive change is good for anyone. The book also speaks about how we get comfortable with our mundane lives and we do not want it to change for fear of losing comfort and the security we are used to. The City Kittens and the Old House Cat is an inspiring story written from a cat's point of view. The story can be understood by all pet lovers. The book has some beautiful and colorful illustrations. That makes the book very attractive and visually appealing, something which all the kids love. Children's books should be colorful and bright. The message of tolerance is very important in the current living situation. The book has a nice moral which can be explained to children and they can be asked to practice it too. Dear Mamta. I appreciate your time and lovely review of The City Kittens and the Old House Cat. Thank you very much for your wonderful review. I was thrilled to share this news with my fans, friends and family.It is an honor to receive such kind words about my work. It is Christmastime at Mrs. D’s home. Nyda – her old house cat – is happy to be inside, away from the harsh bitter elements that winter brings. She worries about her outdoor friends – and she misses Nicky, her former feline companion – but she knows he looks proudly down upon her from kitty heaven as she remembers all of the tricks he once taught her – especially tricks like how to convince the humans around her to give her delicious food! Nyda enjoys the hustle and bustle of the holidays. She loves visits from family members and all of the delicious treats they bring! But she is not prepared for the surprise that Mrs. D.’s daughter brings to her home this particular Christmas! 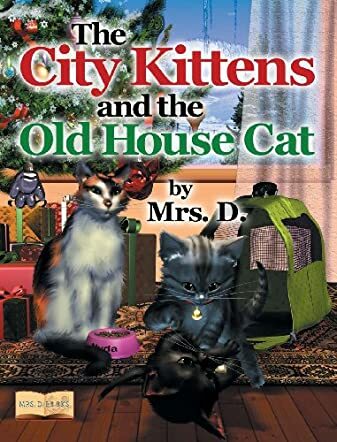 The City Kittens And The Old House Cat by Mrs. D. is the delightful tale of Nyda – the old house cat – and her adjustment to the two city kittens that move into her home and rock her world. Like many of us who find themselves faced with new situations, Nyda does not welcome change. At first, she tries to make life difficult for the “spoiled inside city house cats” and does not welcome them into her home. But – when Nyda learns the truth about the kittens and their arrival – her attitude changes and she realizes how lucky she and the kittens are to have a family who loves them! Mrs. D. has created another engaging story that both children and cat lovers will adore. The beautiful illustrations by Mike Motz enhance your reading pleasure. Be sure to add this to your holiday gift list this season – and be sure to enter our holiday giveaway for a chance to win some fabulous prizes! It is time to decorate for Christmas and this was one of Nyda the cat's favorite times of the year. She stayed inside all warm and cozy while Mrs.D cooked all kinds of special treats which she was allowed to eat. A special tree was brought into the house and was decked out with colorful ornaments and lights. Then there were the guest that came to visit including Mrs.D's daughters. There were two litttle problems the daughters brought two kittens, city kittens all pampered and spoiled putting Nyda's into a bad mood. She would like to see the kitten leave her home. What could possibly change Nyda's attitude toward these two cute frisky kittens? The author has written a sweet tale of two city kittens and an old house cat. It brought back some happy memories for me also. It has me ready to pull out the Christmas decorations. I am a cat lover and I just so happen have two cute kittens that like to provoke my two dogs and my grown cats. They are very entertaining like Mickey and Jack the city kittens. The author writes from her heart and family experiences makeing her stories that much more endearing. This book and her others will make wonderful gifts and keepsakes for any child. As far as that go they make wonderful books to have on hand at the grandparents house. Disclosure: I received a free copy of this book from the author for review. I was in no way compensated for this review. This review is my honest opinion.